3rd: Bubble, Blue Merle Border Collie, aged 7, shown by Di from Rochester. A total of six rescue dogs were entered in various classes in the Show. A rosette and prize was donated by Battersea Dogs and Cats Home, and a rosette by Dogs Trust. Oscar, the Retriever who was Best Veteran Dog, shown by Rowan. - Oscar had been kept in a cage in Romania until he was 18 months old. He was almost feral when he was found by a charity. A friend in Romania, who knew they liked Retrievers, contacted Rowan’s family and they saved Oscar, who would otherwise have been put down. Dixie, also a Retriever, aged 4, shown by Eva from Cheshire. - Dixie was living on the streets in Serbia when found by a charity. Eva’s family saw her on the internet and rescued her. 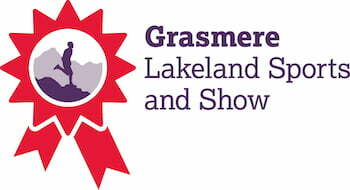 Much of the content on this website is copyright of ‘Grasmere Sports – The First 150 Years’ and must not be copied, reproduced or distributed in any way without the express permission of the author.